At Ss Peter & Paul’s we are presently involved in a professional learning activity aimed at developing best practice language learning. We are currently embedding the pedagogy of language within the classroom using functional language every day. 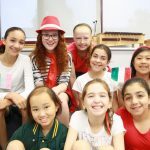 This is supported by weekly Italian lessons with a specialist teacher.